Scones have become my new favorite breakfast treat to make. Over the summer, during peak season – I bought a massive quantity of blueberries for my freezer. Besides throwing them into my yogurt or into pancakes – I haven’t done much else with them. Well, not until making these scones. Oh my – are these amazing or what?! They are tender, flaky and the perfect contrast to the juicy sweet blueberry. It’s like a little bite of summer in the midst of winter. Can’t wait to make these again! YUM! 1. Adjust an oven rack to middle position and preheat to 425˚ F.
2. Grate the frozen butter on the holes of a large box grater. 3. Whisk together the milk and sour cream in a medium bowl; refrigerate until needed. 4. Combine the flour, 1/2 cup sugar, baking powder, baking soda, salt and lemon zest in a medium mixing bowl. Whisk to combine. 5. Add the grated butter to the flour mixture and toss with fingers until thoroughly coated. 6. Add the milk mixture to the dry ingredients and fold with a spatula just until combined. 7. Transfer the dough to a generously floured work surface. Dust the top of the dough with flour, and knead with well floured hands, 6-8 times, just until the dough holds together in a ragged ball. Add small amounts of flour as needed to prevent sticking. 8. Roll the dough into a 12-inch square. Fold the dough into thirds like a business letter (a dough scraper really helps with these steps). Fold the short ends of the dough into the center in thirds, to form an approximate 4-inch square. Transfer the dough to a plate lightly dusted with flour and chill in the freezer for 5 minutes. 9. Return the dough to the floured work surface and roll into an approximately 12-inch square again. Sprinkle the blueberries evenly over the surface of the dough, and gently press down so that they are slightly embedded in the dough surface. Using a dough scraper, roll the dough up to form a tight log. Lay the log seam side down and press the the log into a 12 by 4-inch rectangle. 10. Using a sharp, floured knife, cut the rectangle crosswise into 4 equal rectangles. Cut each rectangle diagonally to form 2 triangles. Transfer to a parchment lined baking sheet. 11. Brush the tops of the scones with melted butter and sprinkle lightly with sugar. 12. Bake until the tops and bottoms are golden brown, 18-25 minutes. Transfer to a wire rack and let cool at least 10 minutes before serving. These look so good, my wife loves scones. We might have to give these a try this week! These do look amazing! And I love the color! I can just imagine one of those perfectly ripe blueberries popping in my mouth. Delicious. Blueberry scones are some of my favorite scones too; I particularly love the papaya scones I make from my own papaya "tree". 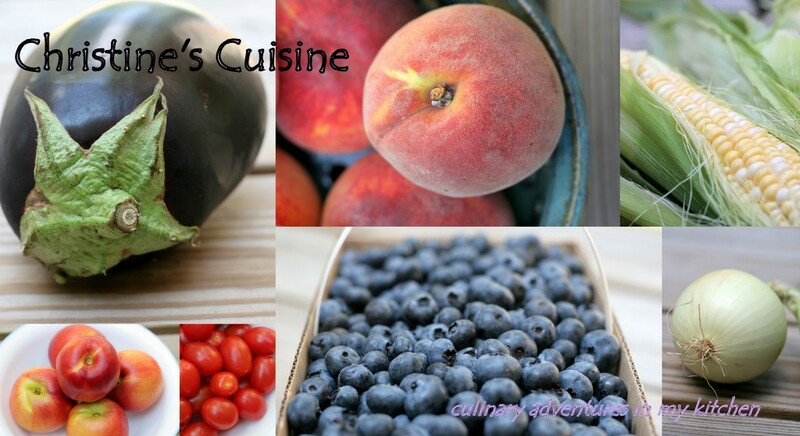 I very much like the features on your blog, especially the printable recipe feature. However, I do wish you would put the original source, in this case Cooks Illustrated, on the printable recipe along with "Printed from Christine's Cuisine Blog". That seems less likely to imply that you originated the recipe or to offend the originator of the recipe. TheTraveCook - the printable version is just to make it easier to print out the recipe. It is not intended to make it seem like I invented all of the recipes. I always clearly label the source for each of my posts. Additionally - I make adjustments to the recipes and the directions - if I didn't provide a link to my blog on google docs there would be no source for the work that I put into these posts or my photographs.